The EmbracingSound™ system comprises the Transducer configuration and an adaptation of the stereo signal called the EmbracingSound ™ processor. Instead of reproducing a left and right signal from two wide spread monitors/loudspeakers, a single Monitor Systems is used. Any L/R-signal is used as a feed, which the built in Processor transfers into mid- and side-information. The mid-information is equal to the mono compatible part in a stereo signal. In the next step the Mid information is cancelled from the summed Left/Right channel - which gives the side information (directional part of the stereo signal). The correct mix between the isolated information (mid, positive and negative polarity sides) is then transferred to the two groups of loudspeakers with the purpose to reproduce the Left and right signal to the ears of the engineer, making all decisions easier resulting in a better mix. That's it - sounds simple - sound ingenious, a step further towards perfection. Now with this technology at hand everybody is able to experience the definition capabilities of a proper stereo signal and to be in a position to perceive all the information put into a recording! Even if this concept is far from what we knew, it gives the engineer a very good representation of what is stored on the media! “Please keep in mind -The media is copied and published to the end user and never the listening situation!!! So you got to know what’s on “tape””! 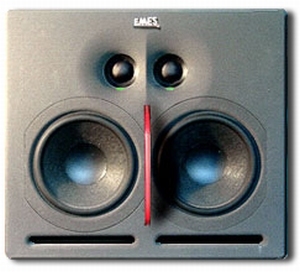 The EMES mini-OWL and OWL-System are 2-channel 2 way active system (complimentary Mono Speaker are PINK tv active and VIOLETT HR active - please consult related product brochure for details) using the EmbracingSound™ technology to reproduce a 180-degree wide "embracing" sound image from one box. The active control delivers 4 x 80 W (mini-OWL) and 2 x 120W (OWL) peak power to the two woofers and the two soft dome neodyme tweeter. All components are matched to get a max. pair-difference of ±0.25dB!! "We have to build it within these limits so the performance does not suffer. - And we want the best possible quality after waiting for such a long period of time." Please see also EMES ADVANCED SURROUND™/MODUMO™/Pink tv and VIOLETT HR active brochures for additional information!